On Friday, Sept. 23 a female driving with her infant towards Port Alberni crashed into a rock face near Cameron Lake. 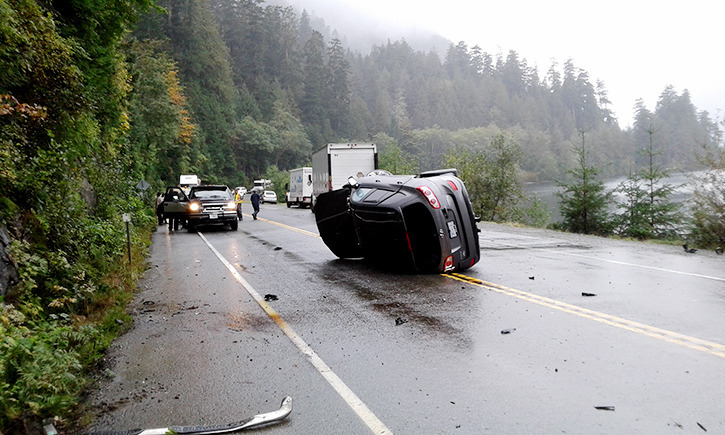 Sep. 23, 2016 8:00 p.m.
A female driver, heading west towards Port Alberni with an infant was sent to Nanaimo Regional Hospital with lower back injuries after she crashed her vehicle near Cameron Lake on Friday, Sept. 23. The infant, who was in a car seat, was okay, said Cpl. Mike Elston, with Central Vancouver Island Traffic Services. After hitting the rock, the SUV then sprung back into the middle of the road, flipping on it’s side. “Traffic was backed up heavily,” Elston said. “It was a good hour and a half before traffic was flowing in both directions.